The Man Of The Woods Tour kicked off in March and has sold out in multiple cities throughout North America and Europe with a second North American Tour returning this fall due to demand. Tickets are $399.00, $199.00 and $129.00 and go on sale Friday, August 31st at 10:00am through Ticketmaster. Ticketmaster customers may log on to Ticketmaster.com or call Ticketmaster’s national toll free Charge By Phone number 1.800.745.3000. Tickets will also be available at the Mohegan Sun Box Office beginning on Saturday, September 1st, subject to availability. Members of The Tennessee Kids Fan Club are eligible for pre – sale ticket purchase starting Monday, August 27th at 10:00am through Wednesday, August 29th at 5:00pm. 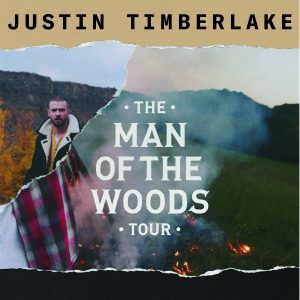 For complete The Man Of The Woods Tour VIP packages information or to purchase, visit https://vip.justintimberlake.com. At every U.S. stop on The Man Of The Woods Tour there will be a VIP Verizon Up section, putting customers up – close – and – personal to the stage and JT. Verizon Up, the company’s loyalty program, is all about thanking customers through everyday rewards and exclusive experiences, like getting closer to the artists they love – including Justin Timberlake.